NARS is pleased to present 'The Map and the Territory,' a group show featuring multiple New York-based artists of varying backgrounds curated by Tansy Xiao. Each artist has rediscovered both the geographical and conceptual notions of maps, as well the powerless and absurd nature of territories. In presenting the glories and defeats of intercultural communications, the show explores the boundaries between the accessible and the inaccessible, the seen and the unseen. Ultimately, to question the reality that we live in. The New York Art Residency and Studios (NARS) Foundation is a 501(c)(3) not-for-profit arts organization committed to supporting artists and curators on an international level as well engaging the local community in Brooklyn and the Greater New York area. NARS provides an array of creative support services and professional development opportunities for emerging and mid-career artists through short-term integrated residency programs, progressive exhibition programs, international exchanges, and engaging public programs that foster global understanding and dynamic cross-cultural dialogues. These services operate in conjunction with our community outreach initiatives to promote greater accessibility to contemporary art for the under-served local community in south Brooklyn. Our mission is to present diverse platforms on which to nurture creative inspiration and innovative cross-pollination of ideas. Mark Amerika is best known for creating Internet and video narratives that explore the relationship between digital images, electronic forms of writing, and sound art. Amerika uses his background as a published novelist and filmmaker to create works of art that function as literary and philosophical commentaries on digital pop culture and technology. Among his most well known pieces is GRAMMATRON, one of the first works of Internet art selected for the 2000 Whitney Biennial of American Art. His new media artwork, FILMTEXT, was originally commissioned by the ICA in London as part of his retrospective exhibition, How To Be An Internet Artist. His work Immobilité was the first long-form work of video art shot entirely on a mobile phone and was included in his mid-career retrospective at the National Museum of Contemporary Art in Athens. Alicja Gaskon focuses on dividing lines, such as political borders and social barriers in her works. Gaskon received her MFA from the Academy of Fine Arts in Warsaw and is a graduate from Architecture (WSEiZ). She received grants and residencies from StartPoint Prize, New York Foundation for the Arts NYFA, NARS Foundation, ArtSlant, and the Ministry of Culture. Gaskon has been exhibited widely in numerous solo and group shows in Europe and North America, including Balzer Projects in Basel, Switzerland, Solo Positions in Berlin, Germany, Le Guern Gallery in Warsaw, Poland, Ledygel Institute in Budapest, Hungary, Times Square in New York, USA, Artissima in Turin, Italy, Saatchi Screen Project, Saatchi Gallery in London, UK, Vienna Contemporary in Vienna, Austria, and most recently at the Korean Cultural Center in New York, USA. She holds her studio practice at the Elizabeth Foundation for the Arts in Manhattan and is a current Artist-in-Residence at the NARS Foundation in Brooklyn, New York. Meir Gal is an artist, lecturer and screenwriter. He was a curator for a contemporary private art foundation in the U.S. and Europe as well as an art critic for the Tel Aviv based Studio Art Magazine. Since 1997 he has been teaching photography, art theory and art and politics at the City University of New York. As faculty at the School of Visual Arts, he teaches art theory and studio art in the Art History and Fine Art departments. His work has been shown in galleries and museums in Israel, the United States and Europe, and recently surveyed in Radical History Review (Duke University Press). He is also currently co-producing several film projects and has written screenplays including American City about New Orleans during Hurricane Katrina which is being co-produced with Leonardo DiCaprio's company Appian Way. Joyce Kozloff had been an originating figure of the Pattern and Decoration movement since 1970. During the 1980s, Kozloff concentrated on ambitious public commissions in the US and abroad, many in transportation centers, executed in ceramic tile and/or glass and marble mosaic. By the 1990s, maps had become the foundation for Kozloff’s private work, structures into which she would insert a range of issues, particularly the role of cartography in human knowledge and as an imposition of imperial will. 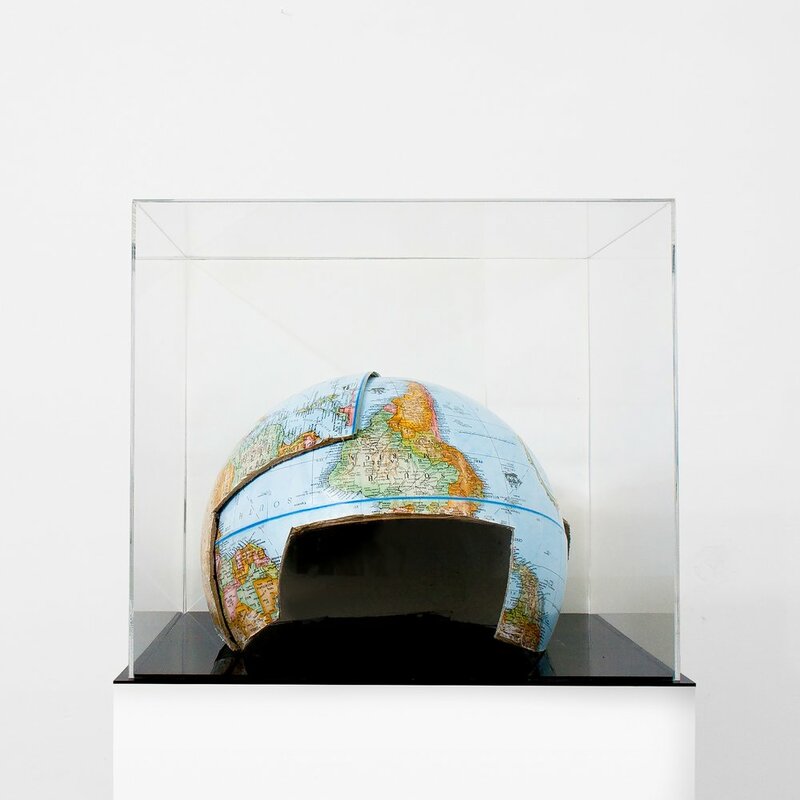 Her map and globe works – frescoes, books, paintings, sculptures - which image both physical and mental terrain, employ mutations to raise these geopolitical issues. Her work luxuriates in the sheer beauty of maps, as incised diagram and reflection of our world. Bonam Kim is a sculptor based in Brooklyn, NY. She received a BFA and MFA degree from Hong-ik University in Seoul, South Korea. In 2016, she completed her second MFA in sculpture at Pratt Institute in Brooklyn, NY. She was featured as an emerging artist from DongBangYoGae, Art in Culture magazine in Seoul. Also, she was nominated for the Dedalus Foundation MFA Fellowship. She has participated in the residency program at Trestle Art Space (June - December, 2016) and was awarded the Stutzman Family Foundation Graduate Fellowship for her residency at the Vermont Studio Center (February, 2017). She will be at the Wassaic Project Residency this Summer. Mitch Patrick's studio practice encompasses a range of digital media, 3d printing, and drawing processes. Much of these practices look at the function and representation of pixels in digital images through the use of glyphs and typography. His 3d printing practice rigorously investigates the bildpunkt, a German photographic term meaning "picture point"and explores its recent history (as a pixel) through current cosmological research programs. His looping videos and performance work exhibit digitally constructed tableaux detailing the peculiar interactions between viewers, screens, pixels, and time. Mitch holds a BFA from the University of Montevallo, and a MFA from Brooklyn College. Unlike the varying ideologies and beliefs, national identity is probably the only thing that the majority of the population, despite their different statuses, were never taught to doubt. However with 2 billion active users, Facebook as one of the largest social media platforms now has more population than 3 of the world’s biggest countries. Throughout my travels around the world, I’ve noticed two universal scenes across the globe: beaches, and malls. Online vacation photos are our new compulsive freedom. The Map And The Territory is a collective representation of the anxiety we feel under the glories and defeats of globalization. Each artist provides their own perspective to question the status quo: the fact that the world population is divided into 195 countries and were assigned different territorial, financial, and human rights, yet celebrate the same ecstasy of entertainment that was sold to us as another commodity. As Alicja Gaskon cut a globe into pieces to build a helmet, and Joyce Kozloff pasted tanks onto the current world map as the latest step of the power expansion of the United States, many artists in the show have addressed the impact of military activities as a major force which contributed to the making of the borders and nations that we know today. Borders do not solely exist between countries, but also within countries. With the absence of museums in Israel on aerial photographs, Meir Gal criticized the censorship of the disclosure of military secrets, as well the non-resistance and even collaborations between cultural institutions and the state. The repressive state apparatus decides what shows in our feed on social media and what’s hidden, to ensure that we perceive the world through images that are deemed appropriate by the state in accordance with their vision. On the other hand, multinational enterprises have obliterated borders and turned the exploration of new territories in outer space into another economic warfare. Mitch Patrick’s 3D-printed pixelated photograph from the raw image feed from NASA’s Curiosity Rover on Mars is a subtle reminder that it was the same federally funded research and development center who propagated the terminology of today’s pixel that also helped design and manufacture the spacecraft on Mars. There are also pieces with a dark sense of humor. Bonam Kim has built miniature sport games that are impossible to score for either side in order to express the frustration of communication between different cultures. Mark Amerika utilized Google Street View’s online mapping program to create a rich field of morphing glitch aesthetics that reveals the way online technologies stitch new forms of reality into what passes as a representation of the real.